Its widely believed that the fasting food is pale and tasteless but this Variche Thalipeeth is a mouth buster. Very delicious and flavorsome this thalipeeth is an absolute favorite of anyone who has tried it once. The crunchy peanuts give it a wonderful crunch where the chopped coriander gives it a fresh flavor. 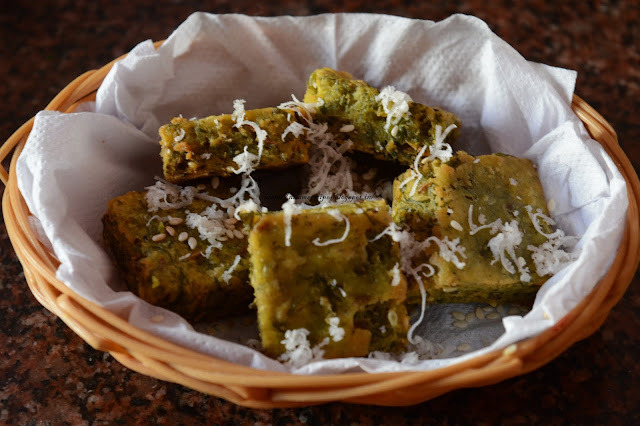 Crispy and tasty this Thalipeeth is made of Samo Rice flour, which is also called as “Bhagar” or “Varai” in Marathi. For similar recipes, check Nachni Thalipeeth, Sabudana Thalipeeth, Bhajani Thalipeeth and Mixed Flour Thalipeeth. In a mixing bowl add varai flour, add crushed peanuts, cumin seeds, salt, chopped green chillies, chopped coriander, yogurt. Take little dough and press it with your fingers to flatten it out. Press and make a thalipeeth, if it feels sticky, use little water. Now heat tava and put thalipeeth on heated tava. Make hole in it and add few drops of oil in the hole and around the thalipeeth. Cover it with a lid and let it cook for another 5 minutes. Remove from tava and serve with yogurt. 1) In a mixing bowl or plate add varai flour, add crushed peanuts, cumin seeds, salt, chopped green chillies, chopped coriander, yogurt. 2) Mix well and knead dough by adding sufficient water. Taste it and adjust salt as per taste. Use little oil to knead the dough. 3) Take little dough and press it with your fingers to flatten it out. Press and make a thalipeeth, if it feels sticky, use little water. 4) Now heat tava and put thalipeeth on heated tava. Make hole in it and add few drops of oil in the hole and around the thalipeeth. 5) Cover it with a lid and let it cook for another 5 minutes. 6) Turn it over and let it cook for another 3-4 minutes. Remove from tava and serve with yogurt.